[O Seeker of Haq] Listen! Man should be, in every condition, the Master-of-Ilm and intelligence - whether the Station of the Nasoot is afar, whether is Hazoor and Lamakaan in Lahoot . And he should do the Tahqeeq (verification) and distinguish the Stations of Haq and Baatil by every Zikr Mazkoor whether the Station is of Drowning in the Noor of Fanaa-Fi-Allah (Destroyed in Allah ) and be Favorite (and Accepted one) of the Gaze of Allah and whether he is attendee of the Majlis of the Overlord of Cosmos - the pride of beings - Hazrat Muhammad Sal Allahu Alaihe Wa Aa-lehee Wa-sallam , who is the Muqarrib of Lord with the Bulk of Noor. 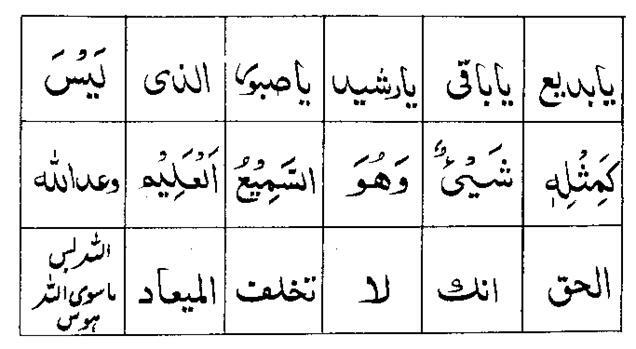 The tyro Seeker the Master of Haziraat the People of Muraqiba the People of Ayan and the People of dream, when he goes to Inward by means of Visualization, Tasarruf , Tawajuh and Tafakkur, he, at the time of the exercise of preoccupation with Lord, should verbally recite the Darood Shareef , the La Haul (La Haula Wa La Quwwata Illa Billahil Aleyyil Azeem ) or Kalimah Shahadat (Ash Hadu An Laaa-Ilaaha Ill-Allahu Wa Ash Hadu Anna Muhammadan Abduhu Wa Rasooluhu: I bear witness that no-one is worthy of worship but Allah, the One alone, without partner, and I bear witness that Muhammad is His servant and Messenger) ) and the Kalimah-e-Tayyeb with the Depth of Laaa-Ilaaha Ill-Allahu Muhammad-ur-Rasoolu-Allah Sal Allahu Alaihe Wa Aa-lehee Wa-sallam . If that Inwardly Station and Majlis the honor of Hazoor is Real, it stays intact and as it is by matching with the ambit of these words of Zikr Mazkoor and if those occurrences are Devilish, of Nafs, of Jununiyat and perplexity (and inner turbulence), they are vanish and dispelled. Which Course is that, that the Visualization of the Name-Allah-the-Essence (Ism-e-Allah-Zaat) and Visualization of the Sacred Name Muhammad Sal Allahu Alaihe Wa Aa-lehee Wa-sallam takes the Seeker in the Majlis of the overlord of entire universe - Hazrat Muhammad Alaihi Afdal ul Salaat Wa Akmal Attahayat ? At that occasion, the (efficacious) effectiveness (and the impact) of the Name-Allah-the-Essence (Ism-e-Allah-Zaat) and the Majlis of-Muhammad Sal Allahu Alaihe Wa Aa-lehee Wa-sallam dominates and Absorbs the Seeker in such a way that, because of the greatness of the Name-Allah-the-Essence (Ism-e-Allah-Zaat) and the Majlis of-Muhammad Sal Allahu Alaihe Wa Aa-lehee Wa-sallam , the Seeker becomes lifeless. It appears as if he will die. In case, he sees, life slips from hand and if he does not see, becomes perplexed (and turbulent) in Hairat . What is meant is this that he, whose Bulk of the Haft-Andaam becomes Noor like this, he also becomes eligible for Hazoor .